A new online alert system designed to help government agencies and small and medium-sized enterprises (SMEs) keep track of the latest information on regulatory requirements for international trade was launched today (8 November) by the United Nations Department of Economic and Social Affairs (DESA), the World Trade Organization (WTO) and the International Trade Centre (ITC). 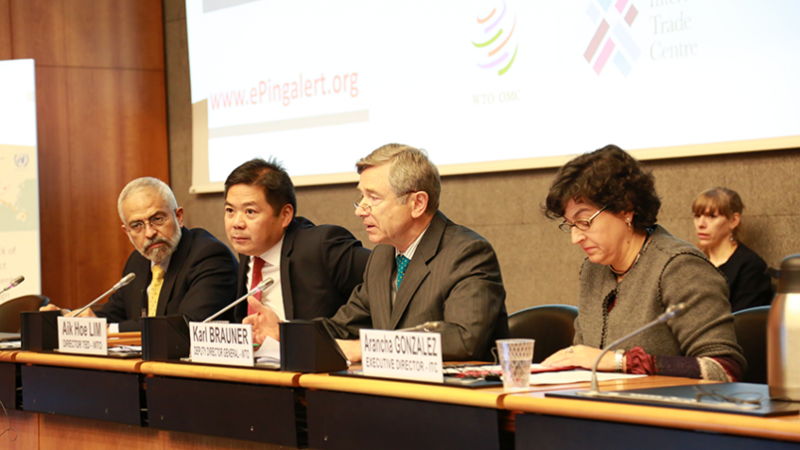 The system, known as ePing, was launched at a special meeting of the Technical Barriers to Trade (TBT) Committee at the WTO. This new system allows access to WTO members’ notifications of TBT and sanitary and phytosanitary (SPS) measures. It also facilitates dialogue among the public and private sector in addressing potential trade problems at an early stage. Users of ePing will be able to easily keep up-to-date with notifications affecting foreign markets and products of particular interest to them. In recent years, the number of technical regulations and standards adopted by countries has grown significantly. Consequently, the need to comply with different foreign technical regulations and standards involves significant costs for producers and exporters. Each year the WTO receives more than 3,500 TBT and SPS notifications proposing new measures that may affect international trade. By improving access to this information, ePing will help avoid disruptions caused by these measures. New regulatory requirements for international trade are applied by WTO members to ensure food safety and animal and plant health. For example, an SPS measure can regulate the treatment of imported fruit to prevent pests from spreading. A technical regulation may set out requirements (for example, labelling, safety, environmental performance) and testing procedures for products. WTO members need to ensure that these requirements do not create unnecessary obstacles to international trade. A Memorandum of Understanding, signed by the heads of the organizations – UN Under-Secretary-General for Economic and Social Affairs Wu Hongbo in DESA, WTO Director-General Roberto Azevêdo and ITC Executive Director Arancha González – formalizes the cooperation between the three organizations.